You might remember Jason Rohrer as the man behind Passage, the emotionally loaded 5-minute art game that has been met with equal amounts of praise and condemnation from the indie games community since its release in 2007. Now Rohrer is back with a new game that challenges the pillars of modern game design by removing the need for pre-programmed A.I. entirely. 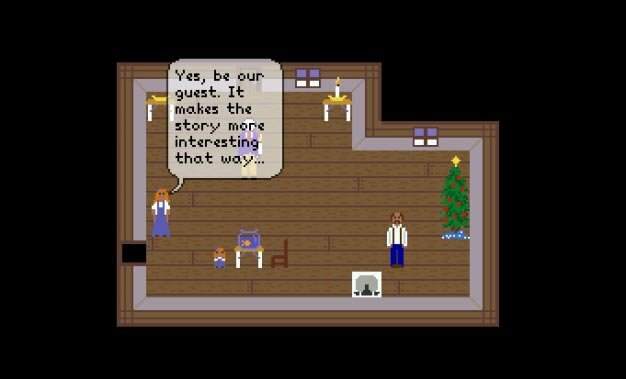 Sleep Is Death is an open-ended two-player graphical storytelling game that combines elements of world-building, text adventure and tabletop role-playing. One player acts as the main character by typing key words to interact with the environment while the second player builds the game world and interacts with Player One through other characters in a sort of ‘Dungeon Master’ role. A slideshow on the official website demonstrates the immense amount of control both players will have over the game mechanics in order to develop and advance their stories. Rohrer has made the game available for pre-order for $9 on his website, with a digital released planned for April 9th.